Preheat oven to 350 degrees F. Bring a large pot of salted water to a boil then cook pasta shells according to package directions. Drain cooked shells then add to a large bowl of ice water until ready to fill. In the meantime, add olive oil to a large frying pan over medium-high heat. Add ground chicken and use a spoon to break the chicken apart, cook 5-8 minutes until brown. Add garlic powder and celery and cook another 3-4 minutes until tender. Remove pan from the heat then stir in hot sauce, ricotta cheese, 1/4 cup of blue cheese crumbles and parsley. Taste for seasoning, add salt if necessary. 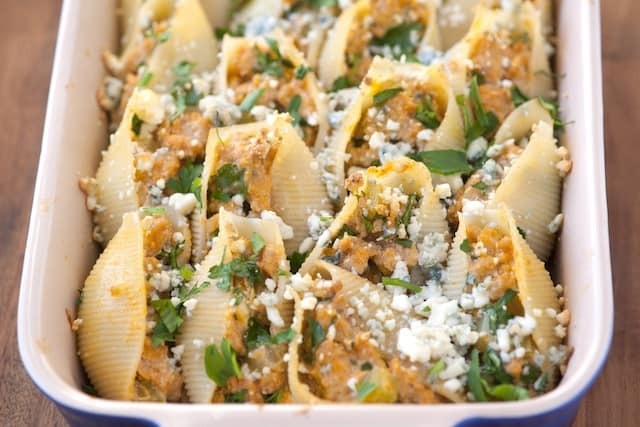 Use a spoon to fill each pasta shell then arrange shells in a baking dish (10-1/2 by 7 inch baking dish works well). Sprinkle tops with 2 tablespoons of blue cheese then bake in the oven 25 minutes until cheese has melted and tips of shells begin to crisp and brown.